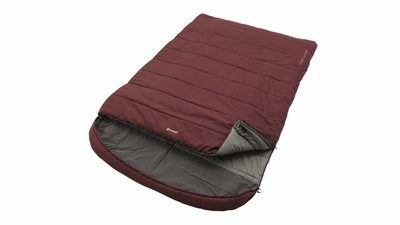 The new Outwell Colibri range takes sleeping bag design to new levels of versatility, comfort and innovation with ample insulation and sculptured style. Packed with versatile features, it delivers a revolutionary duvet feeling with soft next-to-skin fabric for true home-from-home comfort in three sizes. Its flexible wings can be spread to make the upper 120cm wide to support different sleeping positions, it can be opened down both sides and can be unzipped fully to form a duvet. Campers can slip their feet into the snug foot pocket if cold or if overheating, they can slip their feet out of the bag via an opening that sits over the pocket. 150cm-170cm flexible width allows personal balance between insulation and freedom of movement, partially unzip upper and fold out wings for 190cm wide duvet effect, Warm internal fleece foot pocket with protected external aperture that allows feet to cool when required, Super-soft Micro Tricot hood-lining, Zipped pillow pocket in hood, unzip and detach the upper to use a duvet or comforter, Cap compression sack.